A few weeks ago, I took my daughters and one of their friends ice skating. We were all excited to enjoy a bit of indoor winter in San Diego. We bundled up, put on our skates and even got to wear mittens as we entered the ice rink. However, there was a small glitch – my daughter’s friend didn’t really know how to ice skate. She spent a few rounds on the rink hugging the edge and fumbling along, actually rather well, considering she had only been on the ice a few times. She continued like this for a while, with words of encouragement from my daughter, as she glided by, but I could see the frustration on this young girl’s face. I began to closely observe her to see just what she was doing to make her body contort in odd ways, causing her to loose her balance and hug the wall for dear life. Then I decided It was time to jump in to see if I could get her to leave that wall and skate on her own. 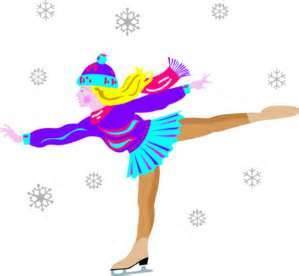 Now, let me be honest, when I was watching this girl skate, she was turning her upper body toward the wall, letting her feet get in front of her torso, leaning backwards often, flailing her arms all about and then hanging on to the wall so she would not fall on the cold, hard ice. At times she looked like a Raggedy Ann doll trying to skate. Her body alignment was so off, that I didn’t really know where to begin. So we started by having her hold my hand instead of hugging the wall. I asked her to focus on just one thing to help her keep her balance as she skated. We steadily moved around the rink and she started to improve! Each time she began to loose her form, I mentioned a key word as a reminder to correct her body position. As she did so, I said “yes,” and a smile lit up her face. I then stopped instructing, but continued to say “yes” each time she started catching herself and correcting her form on her own. Skating got better and better. I hadn’t really given it much thought regarding what I was doing to teach this young girl how to skate, considering I am not a very good skater myself. But by giving her one simple thing to focus on, instead of a slew of instruction, skating quickly improved. Then a funny thing happened as my 10 year old daughter skated by. She had been watching me work with her best friend, and as she whizzed past us, she blurted out, “mom, you are clicker training her.” I laughed out loud and realized she was right. I had given this girl a simple pieces of instruction. Each time she changed her body position toward the desired behavior I had described, I marked the new body position by saying “yes” (similar to making a short, sharp sound by using a hand held clicker) and told her she had done a good job. The moment in which I said “yes” was the exact moment in which she adjusted her body correctly. By saying “yes,” I had given her immediate and clear feedback that she had done something right. In turn, she started to adjust her body more easily and completely on her own because she knew what she was supposed to do, and was motivated by the good feelings that came from success and improvement in her skating and praise from me. And that is what clicker training is all about – marking any behavior that you want to see repeated, and rewarding it with something that your learner (another person, or an animal) finds valuable. As a result, the behavior happens more often because your learner find the behavior in and of itself rewarding. Voila – a new behavior or pattern is created, as well as positive associations with it! So, during this holiday season, let’s practice some clicker training with our family and friends and think about how we can share the wonderful gift of positive feedback. Let’s take some time to observe our kid’s or our spouse’s behaviors and see what we really like about them, instead of nagging them for all the things we don’t like, or wish they would do. As your kids say a kind word, or a thank you for a gift, click them! Let them know you appreciate these pleasant manners. If your spouse brings you a warm cup of coffee in the morning, let them know you appreciate the small stuff. Who knows, maybe your kids will start to say “thank you” all the time without you having to remind them. Or maybe your spouse will not only bring you a cup of coffee, but a warm breakfast as well. All too often, we are so busy rushing around, we forget to let others know what we admire about them. So click people often, reward them with the easy gift of a kind word or gesture, or a special treat and see where these rewards may take you. If you’d like to learn more about clicker training people, or the power of positive reinforcement, go to tagteach.com.